The Sharks: The finned predators may or may not be real — we only see one dorsal fin in the entire film, but that’s not where the real danger lays in Uruguayan filmmaker Lucía Garibaldi’s odd coming of age drama. Instead of an eating machine with razor sharp teeth, we instead have 14-year-old Rosina (Antonella Aquistapache), an inscrutable young woman spending an idling summer with her family until she meets one of her father’s day-laborers, Josello (Fabián Arenillas), a slightly older boy who has mastered a teen-male version of laconic intangibility. After one night of a failed minor trist, Josello seems to happily move on, but Rosina has other designs. She begins a campaign of torment against him, stealing his dog and hiding her in the woods, calling him on the phone with an unregistered number without speaking; and, eventually, something even more elaborate, if not potentially deadly. Garibaldi wisely gives her heroine no particular reason to enact her revenge: Josello is a bit of a dope, but seems to treat her with vague, if diffident, kindness. Rosina isn’t after retribution, we come to understand, rather, she’s a young woman with a growing enjoyment of power and control, and sees the hapless boy as a means to an end. Rosina possesses little of what you might call joie de vivre, nor does she seem particularly morose. She sits in that middle area where it’s just about impossible to tell what she’s considering. With her implacable countenance, the only notable facial expression she makes in the entire film is in Garibaldi’s last shot, with her strolling down the dirt road next to the beach, her former flame in a dire situation, her lips pulled into a slight smile. Birds of Passage: It’s not like you can’t see where this film, about a couple of Indian tribes in northern Columbia who get mixed up in the drug trade in the late ‘60s, is going. If you’ve seen virtually any narco-fueled dramas in the last 40 years (or, say, nearly any title of Scorsese’s), you know the characters will start with very little, go on to build an empire, and topple themselves with greed, selfishness, and ego, but writer/directors Cristina Gallego, Ciro Guerra adds another major element in the narrative, the strict customs of the tribe, the Wayuu, who have built into their culture many sorts of stopgaps to prevent exactly what happens to them. You can always say money changes everything, but the cost here goes far beyond life and limb: We are watching an entire culture get swept up and then swept away, banished to the sands of time (as the film suggests, without really even leaving a trace). Late Night: Mindy Kaling seems to have two primary impulses with much of her material: On the one hand, a push towards refreshingly honest and comedic conversations about race, gender, and class; on the other, a love of standard pop cultural mandate that competes with these previous convictions. It’s a very delicate balance, and when she pulls it off, it can have the simultaneous effect of making her political point while also being entertainingly light on her feet; when it fails, however, it quickly becomes grating. This film, she wrote and stars in, features a nearly washed-up late night talkshow host, Katherine Newbury (played brilliantly by Emma Thompson), in desperate need of new ideas and fresh material, who hires the completely unqualified Molly (Kaling) to add diversity to her writers room. There’s some good character work here between Molly and Katherine, and more than a handful of solid gags, but there are also an equal number of vaguely grating bits with Molly interacting with the male staff – she dates one who turns out to be a cad; while the one that hated her the most… you get the idea – and a propensity to utilize a sort of emotional deus ex machina to have her characters get their way. Lessons are learned, hugs are employed, and everyone ends up better for the experience. Predictions are that it will be a hit, and that might well be the case, but it feels more of a lost opportunity than anything else. The Hole in the Ground: For the first hour of Lee Cronin’s horror film about a young mother, Sarah (Seána Kerslake), who moves out to the country and becomes convinced her young son Chris (James Quinn Markey) been replaced by an imposter, everything feels duly familiar: Of course she has fled a bad and abusive marriage; of course her (real) son is lonely and depressed after the move; of course she has moved into an old and creepy house way out in the country that she is busy remodeling, and so forth. In fact, even from scene-to-scene, the beats and notes feel more than rote (a dinner party with Sarah and some other parents in the town provides various expository notes and little else). 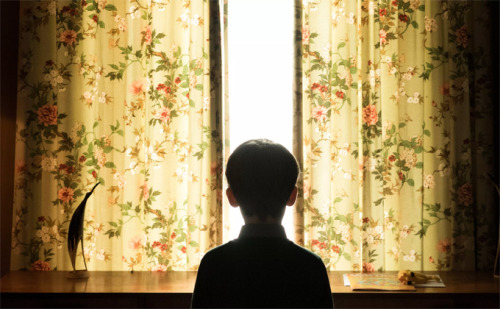 It’s in the film’s last half-hour (essentially when Sarah finally flat-out says to Christopher “You’re not my son”) that Cronin’s film begins to crackle with something a good deal more inspired, and the scares come fast and fulsome. By the end, it has also successfully induced you to similar bouts of paranoia as Sarah – the dénouement is particularly drawn out, it would seem, to bring these feelings directly to the surface – quite a feat from its lackluster first two acts. Tomorrow: After my midnight screening of Hole, I’m going to try hard not to be an idiot, and allow myself a chance to rest in the morning. By mid-morning, however, I’ll be back at it with Shia LeBouf’s autobiographical Honey Boy; Ms.Purple; and a creepy double feature to close out the evening with The Lodge; and the Ted Bundy quasi-bio-pic Extremely Wicked… .